I picked up a canadian mre in a horse trade of sorts. Here is a photo of the contents, it also came with a package of beans, franks and a package of cornbread. It also came with a long spoon, about like a long spoon from a ice cream shop. It was tasty. You ain't supposed to eat the spoon. American solution to the long spoon is to open the package sideways :wink: - kinda like the Russian answer to a pen that writes in space/upside down is a pencil. Ignorance is a long way from stupid, but it can get there real fast. Always remember the Golden Rule: He who has the gold, makes the rules. This is more fun than beating a tree hugger with a dead baby seal. Yes and Canadian MREs have have added advantage of being described in french. For instance a packet of potato soup, is described as soupe de pommes de terre. Sounds much more appetizing don't you think? (09-29-2017, 03:47 AM)Limey Pete Wrote: Yes and Canadian MREs have have added advantage of being described in french. mon dieu man where's the poutine with powdered gravy and maple candy for desert...? Cool tho! Good to know my Canadian boys are eating good. Do Canadian MREs, have heating wafers the same as USA MREs AOC? (09-30-2017, 06:05 AM)Limey Pete Wrote: Do Canadian MREs, have heating wafers the same as USA MREs AOC? You know something Limey....I dont know for sure....do they randyt?? I thought they were the new fangled round canister, but I still prefer the trioxane bar ! damn those Canadian imps.....they are so tasty! Yes they have American heating wafers. 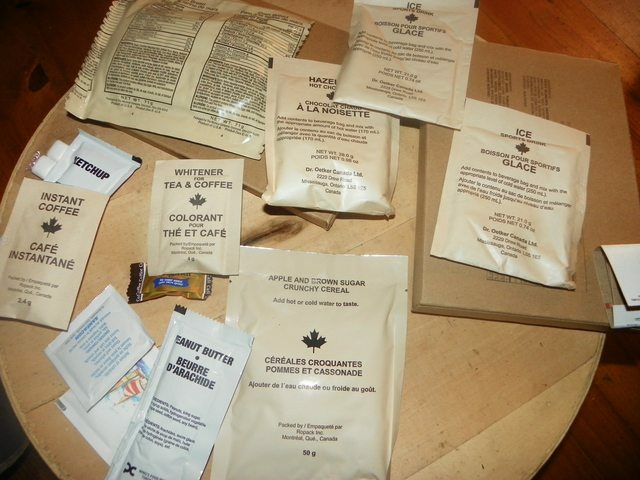 Canadian MREs look very tasty. i hope the mre's taste better than the food i had up there, it all tasted the same to me whether it was toast or spaggetti sauce, all the same. (10-04-2017, 09:52 PM)TRYKER Wrote: i hope the mre's taste better than the food i had up there, it all tasted the same to me whether it was toast or spaggetti sauce, all the same. If the toast tasted like spaghetti sauce, not so bad. The other way around, not so much. Generally when I ate Rat packs, (1988), we boiled the packages to heat them, or ate them cold. Lunch #5 had a coffee crisp, and the cherry cake was worth trading for.